Instinct and terrain are the two watchwords of the French photographer Laurent Baheux. Born in Poitiers in 1970, he started his career in the frenetic world of international sport before moving his horizons to wilder climes, where flora and fauna continue to live in freedom. For over 15 years, he has been compiling a collection of images of nature in a dense and high-contrast monochrome style. With his unique approach which rewrites all the rules on wildlife photography, Laurent strives to capture the personality and humanity in every animal as distinct individuals. 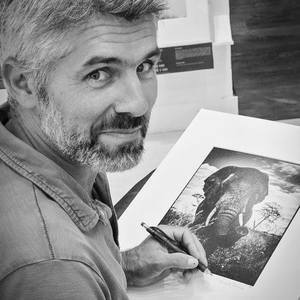 He adopts the role of wildlife portrait artist, where aesthetics and sensitivity take precedence over a more documentary style. Close-up or misaligned shots, noise or grain, stark and deep blacks, he explores every possibility in order to magnify his subject rather than simply showing it. He is an active member of environmental protection organizations such as the WWF, the GoodPlanet Foundation, the Jane Goodall Institute, and the Cheetah For Ever Association. In 2013, he became a goodwill ambassador for the UN Environment Programme in a campaign combating poaching called Wild & Precious. His photographs are on show in galleries and are featured in a number of books, publications, and exhibitions in France and abroad.